Nat Geo Assignment: What’s in a Frame? Man in window, India submitted to ‘What’s in a Frame?’ on National Geographic. Kristian Bertel has contributed to the National Geographic Your Shot photo community with an assignment called ‘What’s in a Frame‘. The photo assignment curated by Stephen Alvarez, a National Geographic photographer, is focusing on framing. As Stephen is saying it: ”- It always amazes me that two photographers can shoot side by side and come up with very different images. The picture is all about how the photographer chooses the angle and what they choose to put in and leave out of the frame”, he says. So while we all as National Geographic Your Shot members are photographing Stephen wants us to think about framing in different ways. Where he suggesting us to try framing from different angles. What does the scene look like from up high and from down below, where we use the form factor of our cameras to help us. In visual arts and particularly cinematography, framing is the presentation of visual elements in an image, especially the placement of the subject in relation to other objects. Framing can make an image more aesthetically pleasing and keep the viewer’s focus on the framed object and objects. It can also be used as a repoussoir, to direct attention back into the scene. It can add depth to an image, and can add interest to the picture when the frame is thematically related to the object being framed. The goal is often to focus the viewer’s attention upon the subject, but the ends and means are ultimately at the discretion of the artist. It is accomplished by manipulating the viewpoint of the image, rather than the object and objects within. The contributing photographer Kristian Bertel framed a picture of a man sitting at a window in the Mahalaxmi area of Mumbai, India. Framing, especially in the photographic arts like with this photograph, is primarily concerned with the position and perspective of the viewer. The position of the observer has tremendous impact on their perception of the main subject, both in terms of aesthetics and in their interpretation of its meaning. His participating photo is just one out of many photographs by the photographer taken in Maharashtra on his latest journey to the subcontinent of India. 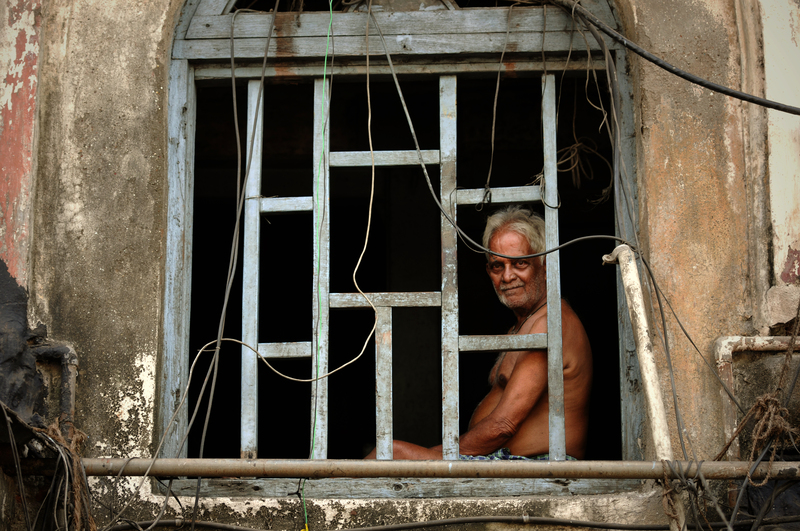 ”- In this picture a man is framed photographically sitting at a window in the Mahalaxmi area of Mumbai, India. Another thing I particularly like about this picture besides the framing is the look of calmness in the expression of the man”, the photographer Kristian Bertel says.